Suffragists around the state took their final action, then watched and waited as male voters cast their ballots on November 5, 1912. When the votes were counted, Oregon male voters had supported equal suffrage by 52 percent. Portland suffragists planned for a victory banquet at the Multnomah Hotel on the evening of November 18 for some 300 people. They prepared with suffrage colors and “by special request of the women who are staunch advocates of ‘home products,’ the good things served will just as far as possible be ‘made in Oregon’ products.” Suffrage colors and a full program would round out the evening. “Victory Banquet to be Celebrated by Suffragists,” Oregon Journal, November 17, 1912, 16. The Oregon Journal named it a “jollification feast” in its announcement of the event on November 17. Governor Oswald West would be toastmaster. Abigail Scott Duniway had the seat of honor at the main table. Many toasts, evidence of strong preparation and the wish to honor those members across many coalitions who had supported the cause, were scheduled. They included “Our Appreciation” by Viola (Mrs. Heny Waldo) Coe; “The Press and the Industries,” E. Hofer; “Women’s Place in Politics,” Senator Harry Lane, MD; “The Work of Our Club,” Sarah A. Evans; “The Highways to the Home,” Samuel J. Hill; “Political Equality for the Nation,” John F. Logan; “College Work for Suffrage,” Emma Wold; “The Wars of the Ages,” Judge P.H. D’Arcy; “Greetings from the State of Washington,” George U. Piper; “The Roll of Honor,” Mrs. L. M. Hidden; “The New Era,” Eugene Brookings; “Our Victory,” W.M. Davis; “Political Equality,” Rabbi Jonah Wise; “Laws for Women—Its Progress,” W.H. Peterson; “The Coterie of States,” Robert Miller; “The Evolution of the Hour,” C.E.S. Wood; “The Social Status of Voting Women,” Dr. Esther Pohl Lovejoy; “Women’s Influence With the Ballot,” Lee Paget. 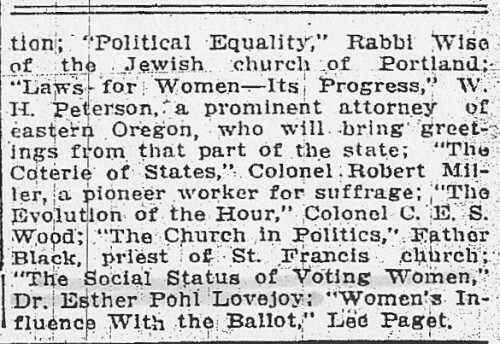 “Women Formally Take Their Place in the New Order,” Oregon Journal, November 19, 1912, 21. So ended a hard-fought struggle, and so continued Oregon women’s fight for complete female citizenship.